Thank you for participating in Global Ho’oponopono April 21, 2017! This will be an annual event and ongoing campaign to inspire healing with continued outreach and education on this important cultural practice. Sign up for periodic updates from Cooperatist Movement! 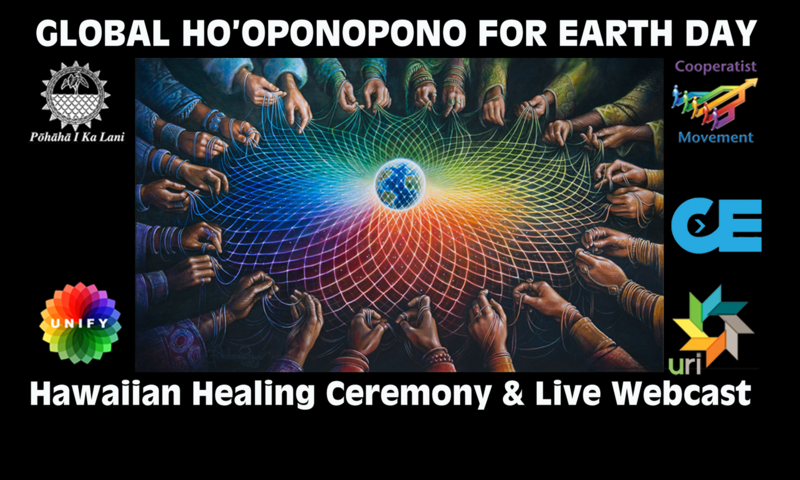 Ho’oponopono is a Hawaiian healing ceremony that invites practitioners to clear blocked energy, trauma, and wounds thus converting negative energy into positive energy, love and deepened connection. The problems we face on Mother Earth are the result of humans being out of balance with themselves, each other, and our natural environment. To bring healing to the earth we must first look within and bring resolution to the history which brought us to the present moment. Hawaiians, living on islands with finite land resources, have a powerful cultural practice that is valuable to all of humanity at this time. Mālama Pono means “to take care of one’s self”. Since the health of our planet and the individual is intertwined we are inviting all to join us for Earth Day by starting within using this simple and profound healing practice.